Renting a car has never been easier with our easy and quick night drop-off at no additional charge. Some client chose this car rental agency in Toronto just for this reason alone – flexibility. Globe understands that people’s schedule doesn’t necessarily line up with our branch opening hours! 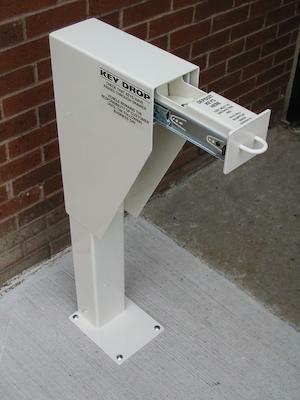 Returning the rented car is now even quicker: simply drop off the car rental keys in our safe and secure drop box 24 hrs / day and Go! We will then inspect the vehicle and close the contract accordingly the next business day. Don’t forget to put your parking entry ticket on the dashboard. The next day, we fetch the passes and close the contract according to the time you returned the vehicle. At certain car rental branches, we use transponders, so if you approached the car garage barrier and the gate opened automatically, then proceed without a ticket. Note: Each auto rental day is billed based on a 24 hour period. Any overage will be billed accordingly past the late return 1 hour grace period (2 hours for VIP clients). If the ticket is lost, we check the surveillance cameras or car transponders to determine the time of return. You remain responsible for the vehicle rented until it is checked by a physical agent the next business day as agreed to on the rental agreement. At the end of the rental period, kindly empty the car of all your belongings, cell phone, etc… before leaving and dropping the rental car keys in the drop box. Note: all car rental branches in Montreal and Toronto have drop boxes in the garage or at the front entrance to the agency.